Discussion in 'Cricket' started by Bearfly, Dec 11, 2016. G'day folks, it's that time of year again where the sound of willow smacking leather is cheered on by big crowds. Yep, Big Bash cricket fantasy is now just around the corner with the first round kicking off on the evening of Tuesday 20th December. This year we have two fantasy comps for BBL-06 (much like last year where we had the official BBL fantasy comp and the Fox Sports fantasy BBL comp) - however for this, the sixth incarnation of BBL, we see the Fox Sports comp replaced by a Supercoach comp!!! There are some differences with the 2 competitions, most notably in the make-up of your teams but also in scoring as well as (most importantly) the prizes - these differences can be found by reading up in the help section of the 2 different competitions, however I will just quickly run through some of them below. Your squad will comprise 16 players - 5 Batsmen / 5 Bowlers / 1 Wicketkeeper on field and 2 Batsmen / 2 Bowlers / 1 Wicketkeeper on the bench - these 16 players must be accommodated within the $1million salary cap. This season, the official BBL fantasy comp has done away with the seperate "All-Rounders" line on the field to better reflect the true nature of T20 cricket where All-Rounders are both Batsmen and Bowlers. You can choose these players as either a Batsman or as a Bowler and use the DPP flexibility to get the best team possible on field each round. There are 3 trades available during each of the trade periods following each round - but beware, you generally only have until the next afternoon/evening before the next round starts!!! You are able to make an unlimited number of changes (on initial entry) to your team up until the start of the respective match for each player of the first round of the competition. With the Rolling lockout each round, you can trade and substitute players, and select your Captain/Vice-Captain, throughout each round right up to the start time of their team's match. Only 2 of the 8 rounds see all 8 teams playing, so beware of the Byes and don't get caught out with a bye player on field!!! Similarly, there are a total of 9 DGW's (Double Game Weeks) throughout the 8 rounds where players in those teams score in both games (provided they play in both) - great for extra points and ideal for Captain choices!!! Now for Prizes - there is $10,000 up for grabs for the overall winner of the official BBL fantasy comp, however this isn't the only prize available. The highest individual score for each of the 8 preliminary rounds will be awarded $500 (total of $4,000). There is also a Pre-Registration prize where the participant who registers at any time from November 17 to 11:59pm AEDT on December 10 2016, and provides the most creative response (as judged by Cricket Australia) to the registration question "In 25 words or less, tell us who will be the player of the BBL|06 tournament and why" will win $1,000. There are also 8 "BBL Team Supported" prizes where the supporter of each of the 8 BBL franchises with the highest scores wins 2 Premium Memberships for their supported team for the 2017/18 BBL season!!! And that's not all - there is also a best performing league prize where the highest combined score of the eight participants in a private league (in 8-team leagues only) at the end of the competition will win $6,000 to be divided equally among the participants. The new kid on the block, SC BBL virtually replaces the former Fox Sports BBL fantasy comp and they look like they seriously want to dominate the BBL fantasy market like they do with AFL and NRL!!! As mentioned earlier, the main differences with SC BBL are the player selection set-up and the scoring - with SC BBL requiring you to still pick All-Rounders as opposed to having these players have DPP status, thus making it a far more complex game when selecting your squad!!! In SC BBL you only pick a 15 man squad (4 Batsmen/4 Bowlers/1 Wicketkeeper/2 All-Rounders on field plus 1 in each position on the bench) - all in the constraints of a $2million salary cap with some fairly hefty prices for some of the really big names!!! The same rules apply with DGW's, Byes, Trades and Rolling Lockouts as they do in Fantasy, it's primarily the composition of the squad that will give you the biggest headaches - but potentially greater rewards if you manage to get it right!!! Prizes for overall placings run much deeper for SC than they do in Fantasy - check it out!!! If you're one of the NINE runners-up, you don't go home empty-handed! Each round, the top SuperCoach BBL (based on their round score) will win a cricket bat signed by personalities appearing on the on the Fox Sports Cricket Show - So even if your team is lagging in the overall rankings or you discovered the competition late, you'll be in the running for a SuperCoach round prize. Unfortunately SC BBL do not have a League prize this season, but it wouldn't surprise me to see that change in future seasons. In the comments I will post the 2 different scoring formats as well as current TS leagues available (and I will edit this opening post with any new Leagues posted and how many positions are available). Like it a lot but not fapping over it..
Not sure about Richardson tbh (and I am a Strikers fan) - am personally more in favour of the Pommy fella we signed ahead of Kane (from all accounts he's pretty handy with the willow as well as the ball). Do you know any latest info on Henriques? Had read somewhere early last week that he was under an injury cloud. Also, is Lynn over his injury yet? Not a fan of Jordan tbh mate, has no real T20 form worth a highlight reel that I know of. Just re-reading this thread, and man, the team I sat down and made today looks amazingly like this one. Only change I've made was Bird out, and brought in Sandhu. 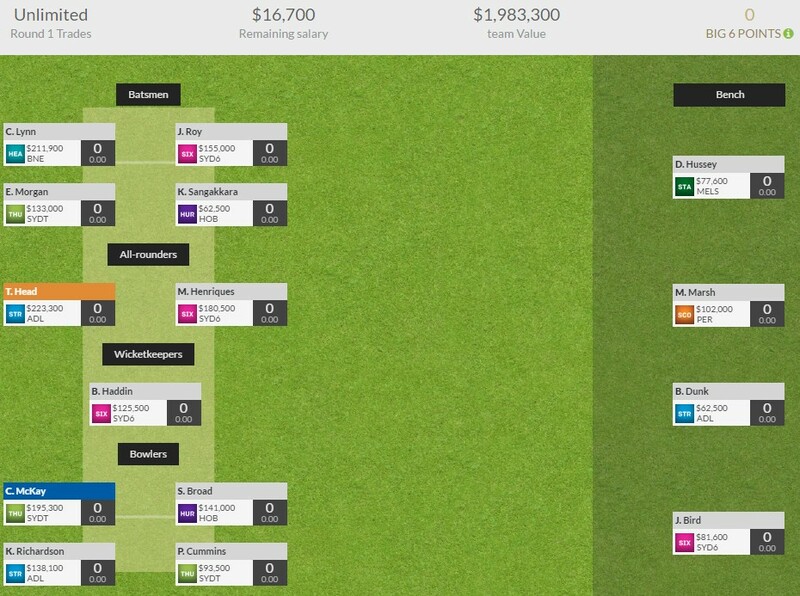 Hey all I have decided to try BBL Supercoach this year.... any tips or tricks for a newbie? Yeah I’m back in this year after a year off. There’s a few Hun articles kicking around to get you started. Have created a league for people to jump in.